Horror movies are only as good as the monsters that inhabit them. From Michael Myers to Jason Voorhees, the slasher genre in particular has created some of the most iconic and distinctive looking mass murderers ever to grace the silver screen. Arguably no other slasher has maintained more mainstream exposure or than the nightmare-stalking Freddy Krueger – played to glorious effect by actor Robert Englund. However, the now legendary Freddy once looked quite different. Bloody Disgusting (follow the link to see the images) has some new pictures that show how Freddy’s look for Wes Craven’s A Nightmare on Elm Street films was almost significantly different. This transformation is chronicled in the crowd-funded documentary Never Sleep Again: The Elm Street Legacy. His trademark sweater was always present, but it had no sleeves, and instead of a fedora, the supernatural serial killer adorned his head with a paperboy cap. This outfit gave him an almost soccer hooligan look, one that – while scary – still makes us appreciate the decision they ultimately went with. The character’s skin was also considerably less burned in the original iteration, but in the end the filmmakers opted to give him a more zombie appearance – apparently inspired by a pepperoni pizza for the ultimate design. Many horror icons went through numerous permutations before ultimately evolving into their iconic forms. Jason Voorhees wore a burlap bag for the early portion of his career before putting on his trademark hockey mask – he wasn’t even the killer in the original Friday the 13th movie. Also, Michael Myers’ trademark white mask – a spray painted William Shatner mask in reality – was the final choice for John Carpenter’s Halloween, but a clown mask was the second choice. Even Ash Williams of the Evil Dead franchise did not really pick up any of his iconic traits – chainsaw hand, double barreled boom stick, and witty one liners – until Sam Raimi’s Evil Dead II: Dead By Dawn. Freddy’s image has become so iconic that it seems unlikely that it will ever change. 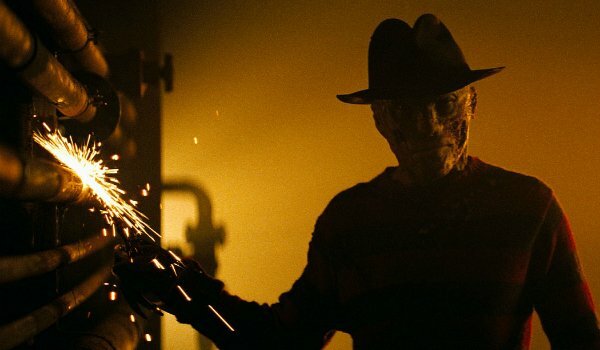 Even the recent A Nightmare on Elm Street remake – which shifted the series to a much more sober and somber tone – opted to keep his appearance pretty much the same as in the original. Portrayed by Jackie Earle Hayley rather than Englund, you can check out his appearance from the remake below. With Halloween upon us, be sure to check out the A Nightmare on Elm Street series – but you can skip Freddy Vs. Jason – and get terrified by Wes Craven and Robert Englund’s horrifyingly iconic creation.